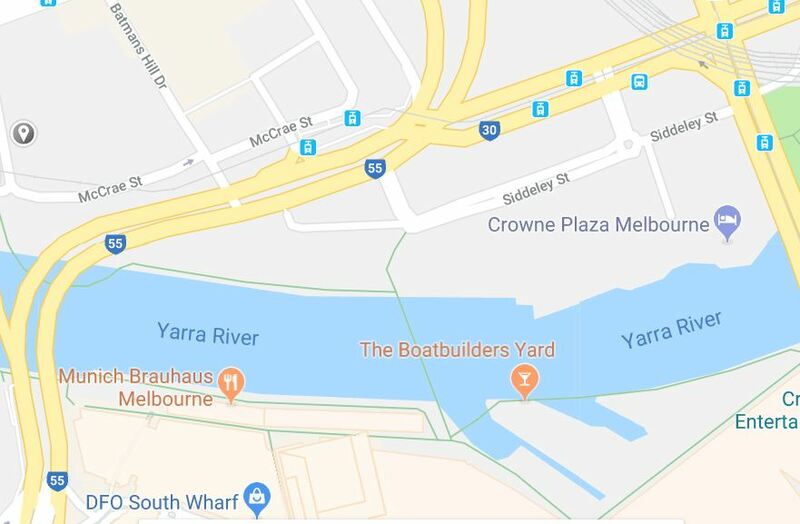 All is upheaval and keep out fences as work begins on the restoration of North Wharf between the Charles Grimes and the Seafarers Bridge – a condition of the approval of a new development on the sliver of land next to the Mission to Seafarers on Flinders St. When the Charles Grimes Bridge was built in 1978 it cut off shipping access to this part of the River. Port activity ceased and the buildings fell into disuse. Container ships needed a completely different set up which could only be provided down river – acres of hard stand rather than sheds. Heritage protected but neglected, Shed No 5 and its associated Malcolm Moore travelling crane fell into a long torpor frequented mainly by seagulls and taggers. The grey graffitied area prompted calls for ‘something to be done’ as its shabbiness contrasted unfavourably with the sunnier reconfigured south bank opposite. Peak shabbiness. Shed no 5 and Malcolm Moore crane in 2013. The context has changed considerably since 2013. With the approval of the development at 731-739 Flinders St, this low key understated north bank is about to change dramatically. The diversions around the works to the wharf compel a walk past the entry to the Mission to Seafarers. Unfortunately, the very mean footpath doesn’t allow for stepping back to appreciate the quaint and very interesting Walter Butler building lest you fall into the fast moving traffic on Flinders St/Wurundjeri Way. It is a very hostile pedestrian environment for a building that expresses warmth and welcome in every detail. This wonderful photograph shows the relationship between the Mission to Seafarers and Shed No 5. 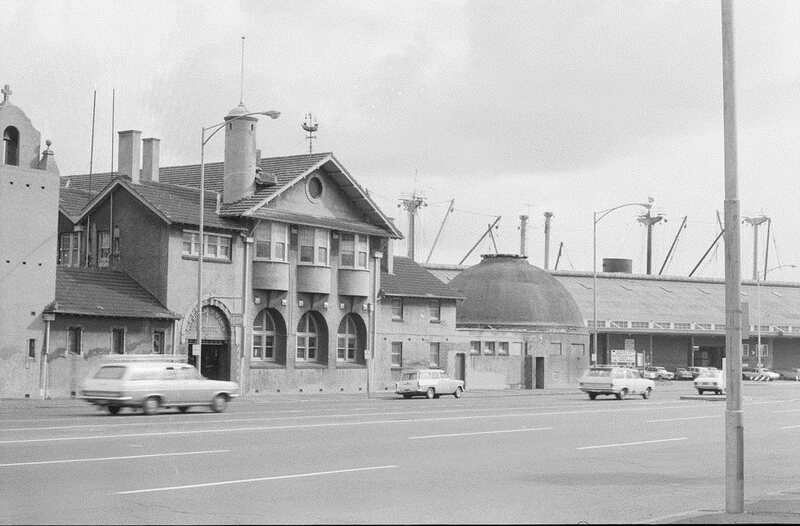 The area between the shed and Flinders St (as it then was) is the location for the new development. The Mission to Seafarers continues to provide a hugely valuable service to seafarers. It is a wonderful place to visit, with several distinctive and special spaces within the combined Spanish Mission and Arts and Craft building. But for today, I’ll stay with the outside of the building and its context. The Norla Dome, the former gymnasium in the complex, is a very special feature of the Mission – both inside and out. 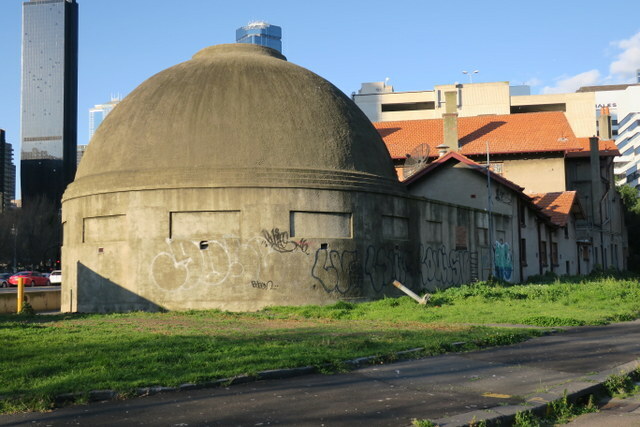 Although sadly tagged, the Norla Dome stands free and proud. The proposed hotel is uncomfortably close to the dome. 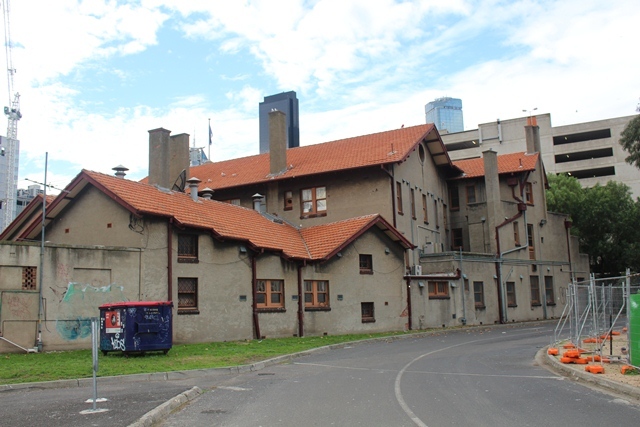 The development also includes the creation of a Seafarers Park to the rear of the Mission to Seafarers. In its new park setting, the rear of the building will become more like the front. 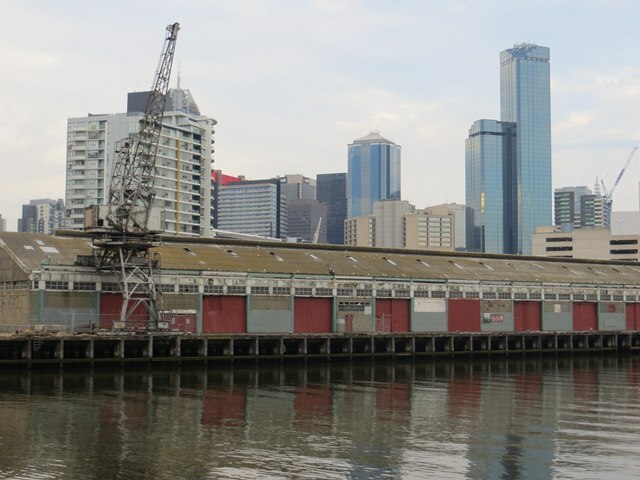 Mission, shed and crane have been recognised with their own citations on the Victorian Heritage Register – the highest level of heritage protection available in planning. The relationships between them, the connections between their clustering and the River should be accorded the highest level of respect so that their Port origins can be clearly understood and revealed.